AY-WO20 is a powerful RFID proximity card reader of 125 KHz cards and tags, featuring multi-format protocol and a read range of up to 100 mm (3.94 inches). With a sleek design and a tough, UV-resistant, water- resistant casing, the AY-WO20 is equally suited to indoor and outdoor use. It is economical and reliable. 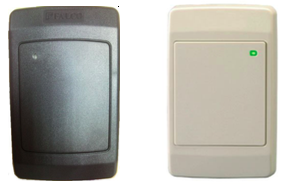 The AY-WO20 with multi-format output reads RFID 125KHz ASK-type EM cards from a range of up to 100 mm (3.94 in.)*. Designed for easy mounting with hidden screws (security screws may be used to enhance strength) and cover. Optical tamper adds protection against wall removal, and the buzzer adds audible RFID card read. LED control can give system based information to the end user. The AY-WO20 is crafted out of the finest materials and to the highest manufacturing standards under ISO 9001:2000 Certified Quality standards.